Synopsis: A brand new novel from a leading children's author: Gwyna is just a small girl, a mouse, when she is bound in service to Myrddin the bard - a traveller and spinner of tales. But Myrddin transfroms her - into a lady goddess, a boy warrior, and a spy. Without Gwyna, Myrddin will not be able to work the most glorious transformation of all - and turn the leader of a raggle-taggle war-band into King Arthur, the greatest hero of all time. There’s something about the Arthurian legend that thrills and fascinates people of all ages, for many centuries. Phillip Reeve’s Here Lies Arthur puts an entirely new spin on the whole myth in a way that will make it a great read for everyone. The story, told from the point of view from the girl Gwyna, follows the Arthurian legend for numerous years in a first person narrative that is unexpected but a highly effective way of narrating this retelling. The writing style isn’t a lot like Reeve’s other works for which he became beloved for, except that it also includes vivid imagery that will have your mind living every moment of the book. One of Phillip Reeve’s greatest talents is that he can tell a story with plenty of description without bogging it all down into something that is unreadable. The characters are fantastic. Unlike Tom Natsworthy in the Mortal Engines Quartet, none of the characters seemed stiff. Gwyna makes for an exceptional narrator, and her emotional journey from the innocent girl to the young woman is believable. The fact that the main characters are also insanely different to what is normally said about Arthur also makes it very intriguing, as they are characters we know who we don’t know. The story, as mentioned, puts an entirely new perspective on of the Arthurian Legend. When Phillip Reeve came upon the idea for Here Lies Arthur, he stumbled upon a jewel. 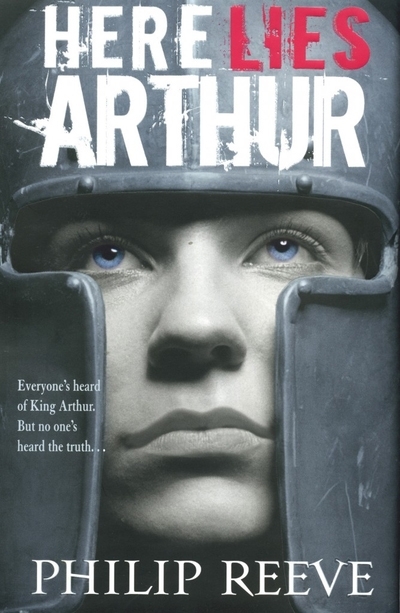 The story is perfectly believable, and in some cases probably a lot more truthfully to what the real Arthur was like. I’ve never read a version of the legend like this, and I think it’s a story that everyone should read- whether they are fascinated by Arthur or not. And although Here Lies Arthur is more of an account than a story with a direction, I could not put the book down! I was reading all evening, desperate to find out what happens to Gwyna and Co. Although Here Lies Arthur is notably one of Reeve’s lesser known works, it is perhaps one of the best. I was surprised to find such a thrilling book about a subject that never really caught my eye before. It’s certainly a very entertaining read that I can see being enjoyed by many people: the story is universal in it’s attraction. What did you think about Here Lies Arthur?